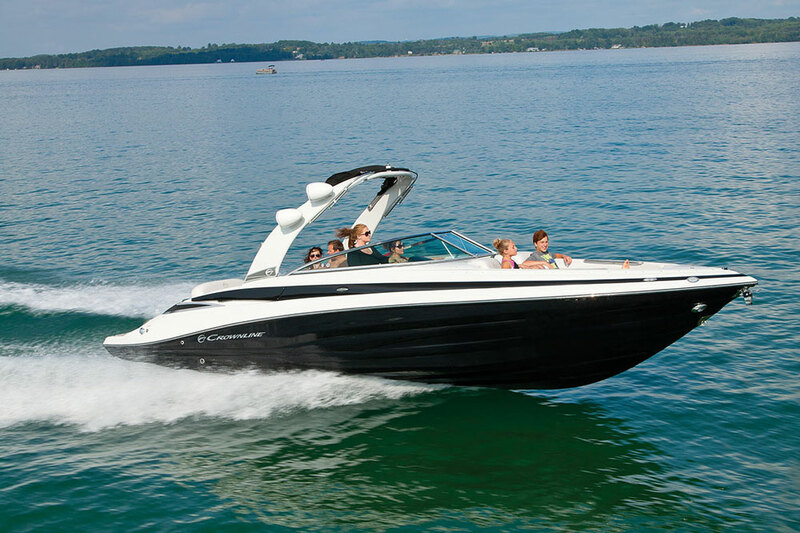 Crownline’s new E-29 XS capitalizes on outboard power in form and function. Putting outboard engines on bowriders is nothing new – and yet it is. Stern drives dominated in runabouts for decades, then we saw a shift to offer both stern-drive and outboard power, and in many cases manufacturers today are offering their runabout models only with outboards—and more specifically with twin powerheads. It’s one of those design trends that has been hiding in plain sight so to speak. 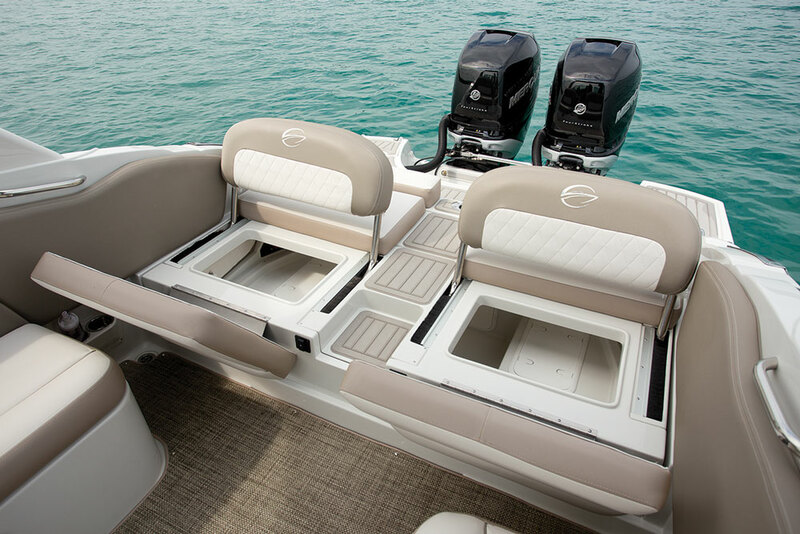 A pair of twin Mercury Verado 250 HP outboards gives the E-29 XS plenty of pep. Take Crownline’s new E-29 XS for example. 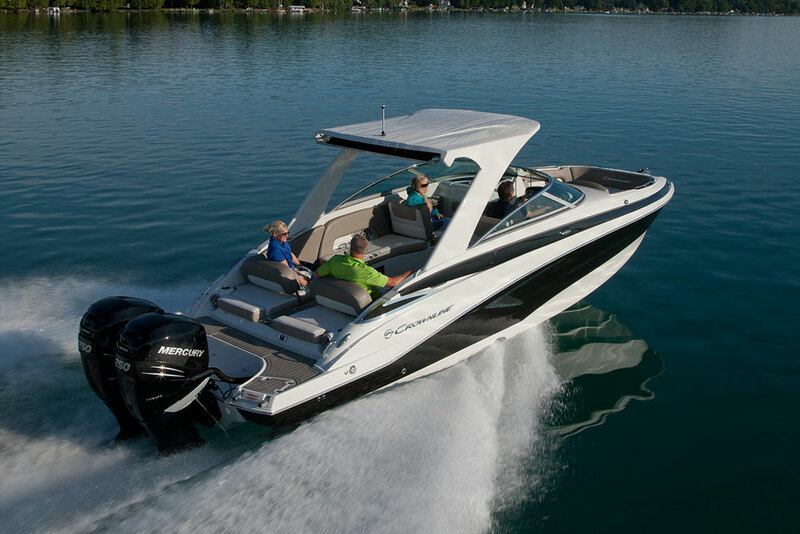 It’s large enough to merit twin engines if it were an inboard, but the use of outboard power gives the buyer enormous range of choice. 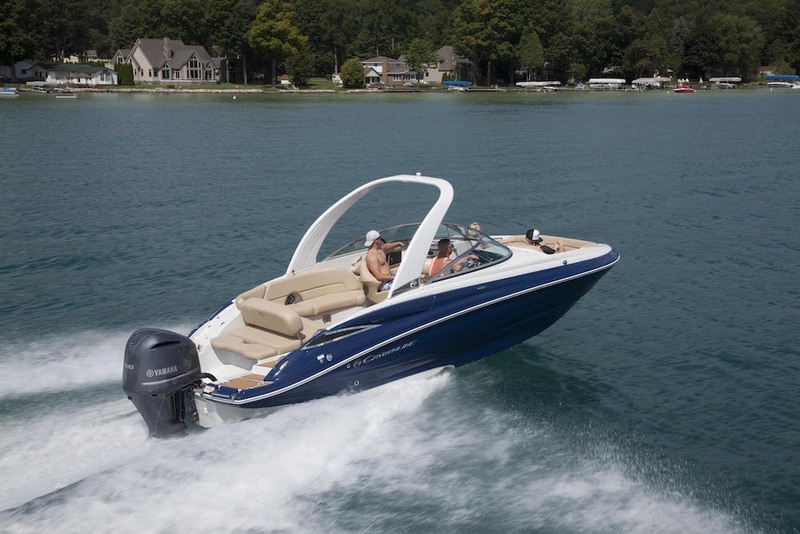 For example, the boat comes standard with twin 250 Mercury Verados with digital throttle, which points up a $201,132 base price. However, buyers can get the “radio delete” option, so to speak, by choosing either twin 200 Verados in four- or six-cylinders. Opting for the four cylinders drops the base price to $190,027 and the six-cylinders set the price at $193,000. That’s probably the better power choice if you’re looking to save money. An inline six-cylinder runs more smoothly than an inline four and it offers a superior torque curve, too. The other thing outboards do is free up a lot of space that was once occupied by the engines and rededicate it to the people on board, and the E-29 XS delivers on that trait. Stern seating is versatile, with backrests that adjust to face forward when underway or toward the stern when swimming behind the boat. 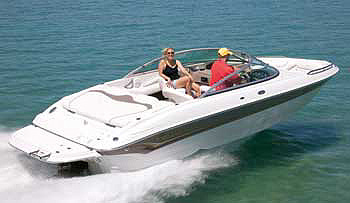 Crownline designers provided a full swim platform to walk around the engines, even when they’re partially trimmed up. They included a ladder off starboard side and a walk-through with a low step up from the cockpit. You can do that because, you know, there’s no engine under the stern sun pad. The stern of the boat can be utilized in very different ways, since it doesn’t have to house engines. Crownline designers also made good use of cockpit space by offering two-wide seating at the helm and observer’s seat. It’s a squeeze fitting two in, but it’s doable. The thigh bolsters on both sides flip up for enhanced visibility or the ability to stand and lean when underway. However, the neatest part about those seats is that the backrest on both sides adjusts to face fore or aft. Pretty cool. What’s also cool are the features includes as standard. 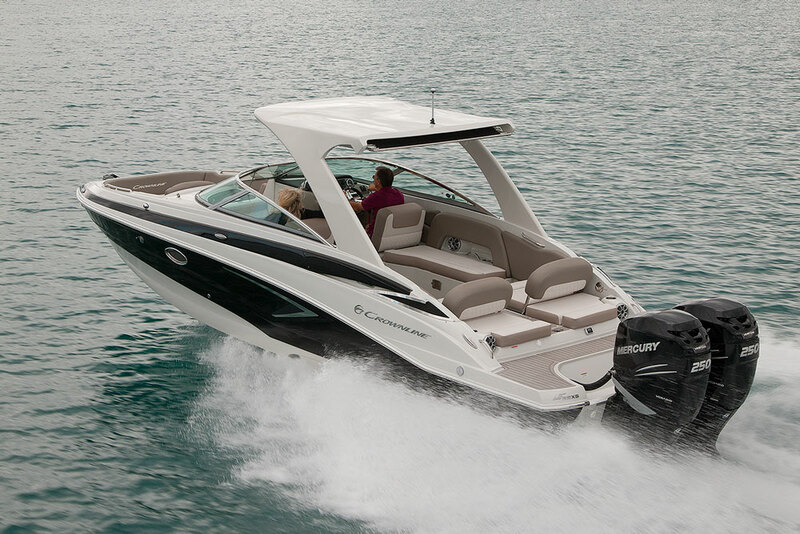 The color-matched bow and cockpit canvas are standard, as is a three-bank battery charger and bow walk-through doors. Cleats are the pull-up variety, which are nice because they hold lines when you want them to, but won’t snag them when you don’t. You also get standard bow and stern docking lights and a Raymarine ES98 touch-screen multifunction display. Of course, if you’re a regular reader of this column, you know I harp on a builder when it doesn’t include a Bimini top as standard equipment included in the list price ($190,027, in this case). There will be no such harping today because Crownline not only includes a Marquis aluminum hardtop with the E-29 XS, but also the telescoping Sure Shade canvas that extends the covered area to the aft lounge. More functional standard items include a removable dinette table, transom shower, trim tabs with indicators, underwater transom lighting, and a power windlass with rode and chain. It also comes with an enclosed head. 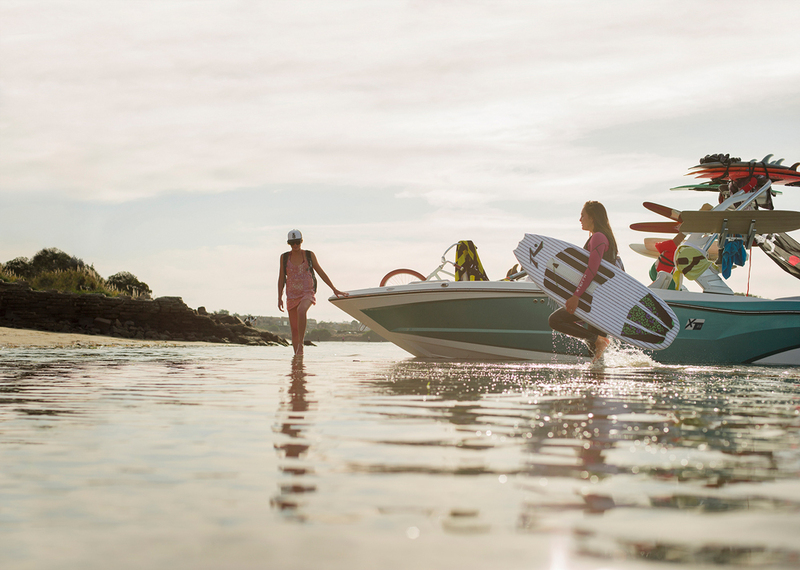 Not all of those features stem from the design freedom the outboard powertrain provides, but many of them do and they’re part of what makes the trend toward outboard power so practical. It’s not clear which manufacturer thought of it first, but Crownline is making good use of it in its E-29 XS. 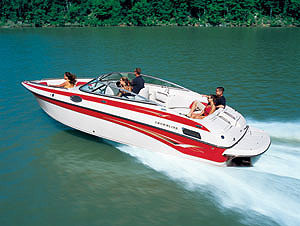 Other Choices: The Regal 29 OBX is another big bowrider that runs on outboard power. 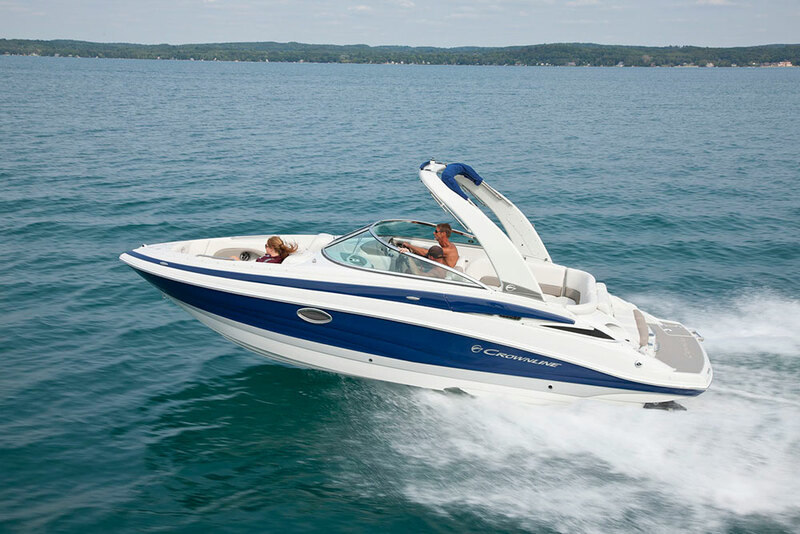 If you’d rather follow a more traditional stern-drive route, see the Sea Ray 280 SLX or the Cobalt R7. 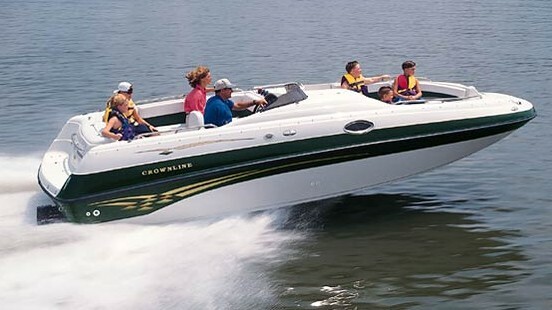 See Crownline E-29 XS listings.